MINNEAPOLIS — A 27-yard touchdown pass from Aaron Rodgers to James Jones staked the Packers to a 27-13 lead early in the fourth quarter, and the Packers held on for a 30-13, important win over the Vikings at TCF Bank Stadium on Sunday. The win leaves the Packers and Vikings tied for the NFC North lead at 7-3 each. 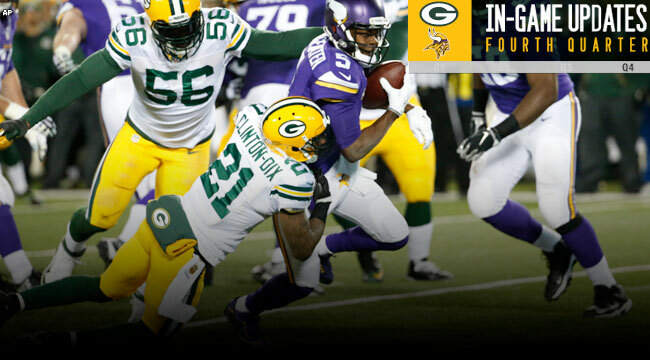 More importantly, the Packers hold the head-to-head tiebreaker advantage over the Vikings. Rodgers looked more like his old self after a month of frustration. He threw for 212 yards and two touchdowns. The win also marked a return to form for running back Eddie Lacy, who topped the 100-yard mark for the first time this season and showed flashes of the power that made him one of the game’s most feared runners. The Packers defense was suffocating, holding Vikings star running back Adrian Peterson to 45 yards rushing and sacking quarterback Teddy Bridgewater six times.